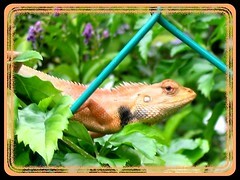 These attractive-looking Calotes versicolor are really attracted to our little garden paradise! They’re frequently seen loitering around, probably because our garden is packed with all kinds of tropical plants, from the low-growing annuals or perennials to the shrubby plants, scrambling vines and tall palms. There are ample vegetation around for them to rest, hide, sunbath or just waiting to stalk their prey. 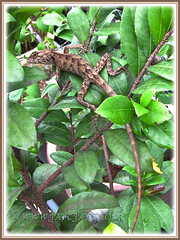 I always get excited whenever I chance upon them among the plants or at the chain link fence bordering our front yard, and will rush inside our home for the Canon PowerShot A60 camera. 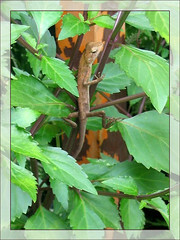 This macro image of the Changeable Lizard or Garden Fence Lizard was recently shot on January 30, 2008, from outside the fence looking into our garden. 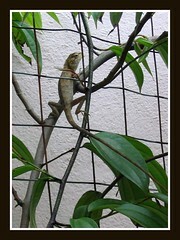 Common name: Changeable Lizard, Garden Fence Lizard, Oriental Garden Lizard, Bloodsucker Lizard, Crested Tree Lizard. 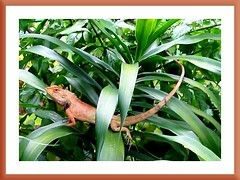 Description: These Changeable Lizards are so named as they can change their colors quite quickly. The main color is usually a light brown to greyish olive and speckled with dark brown bands, though can change to iridescent green, or hued in bright orange, red, blue and black, reflecting their moods and environment. These bright changeable colors are peculiar to the male during the breeding season, whereby its head, neck and shoulders turn bright orange to red, thus given their other common name, Bloodsucker Lizard. Aptly named Crested Tree Lizard too, where both males and females have a dorsal crest extending from the neck to almost the tail. 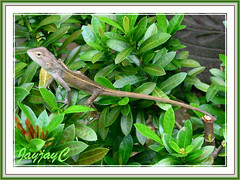 A large matured Oriental Garden Lizard will measure about 15-16 inches, with the slender and stiff tail itself taking 11 inches. 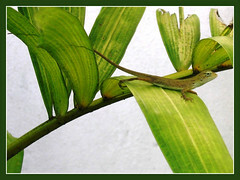 Unlike other lizards, they do not drop their tails (autotomy), though do shed their skins like other reptiles. They have large heads, dilatable dewlaps and undeveloped gular sac. Like chameleons, they can rotate each eye independently. They are distinguished by two small groups of spines, perfectly separated from each other, above each tympanum, and possess massive and strong shoulders, and laterally flattened body. Their teeth are designed for gripping prey, not for tearing. Thus, the prey is swallowed whole after being shaken and stunned. Food: Mainly insects, spiders and small vertebrates, including rodents and other lizards. Breeding: Males become strongly territorial during breeding season. It will battle with any intruding male if necessary to attract a female, by brightening its head and neck to orange or red, plus inflating its throat dewlaps, turning sideways and bobbing its head. After copulation, a female will later lay about 10-20 eggs and bury in moist soil. The eggs are hatched in about 6-7 weeks. The new hatchlings are able to breed at about a year old and the generation continues. Habitat: Found in a wide range of habitats – jungle shrubs and trees, the undergrowth in open habitats including highly urban areas, home gardens, hedges and parks. Distribution: Widely distributed in Asia. Native to SE Iran, Afghanistan, Pakistan, Nepal, Bhutan, India (including the Andaman Islands), Sri Lanka, Myanmar, Thailand, West Malaysia, Vietnam, Pulo Condore Island, Southern China (Yunnan, Guangdong, Guangxi, Hong Kong, Hainan Island), Indonesia (Sumatra), Mauritius (Reunion, Rodrigues) and introduced to Oman and Singapore. Links: For added information, check Wikipedia and here. Hi I am really concerned about my lizard, I did have two but one died about a week ago. It broke my heart and now the other one doesn’t look so good, He/She is the same one as you have in the picture. What can I do to help her/him? Myself I think it’s female. Please will you get back to me as soon as you can with any ideas. I really do not want to loose her. Hi Sue! I’m really sorry to hear about your loss. Sorry too that I have no inkling whatsoever about caring for these lizards because I’ve never reared one before. Hope everything will turn alright for your other surviving pet. hi, im wondering how do i find out if my calote (taylor) is a boy or girl, i just named it a semi-gender name just in case if it was a boy / girl. and do they camoflodge? hi, i want to ask about one thing. The changeable lizard will bite people or not? because i scare about to touch it. my changeable lizard is still baby. Great to know this article had been helpful, darwin! Thanks for letting us know.